6 Easy Steps for Changing Season at Home | Ashgate Furniture Co.
Goodbye to palm print and zesty greens, hello to Autumnal reds, yellows and cosy nights in. Excited? Us too. And without an Emergency Autumn House savings fund, it’s time to start thinking about simple, and easy steps for changing season at home; transitioning from Summer to Autumn – the chillier conditions and festivities it brings with it. We’ve added 6 easy ways to add a little warmth and style to the home for Autumn. Velvet, sherpa and fluffy throws are the easiest way to get cosy and warm this season. Storing nicely in a basket, or folded on shelves, rule no.1 of Autumn is Thou shall never be more than 5m away from something cosy. Something we all absolutely love about the fall season is playing in all the fallen leaves, in their skeletal, golden red wonder. Bring the feeling indoors, with leaf prints and wood scenes on soft furnishings, wall art and accessories. There’s nothing quite like a quiet reading nook with a cuppa in the wintery months. Investing in a fireside chair to curl up on after a long day will bring a huge amount of comfort and warmth to the house – and is more cost efficient than a whole sofa re-buy. These DIY Autumn Leaf Fairy Lights are the perfect rainy Sunday craft project, and looks beautiful against the windows. Small crafts are the ideal activity for the Autumn – for adults and kids – and gives you something to do when the weather isn’t in a ‘crispy dry leaves’ mood. If you’ve not already got your dining space prepped and practical, it’s time to start thinking about re-inventing the space to be a little cosy or modern space for board games, wining and dining. 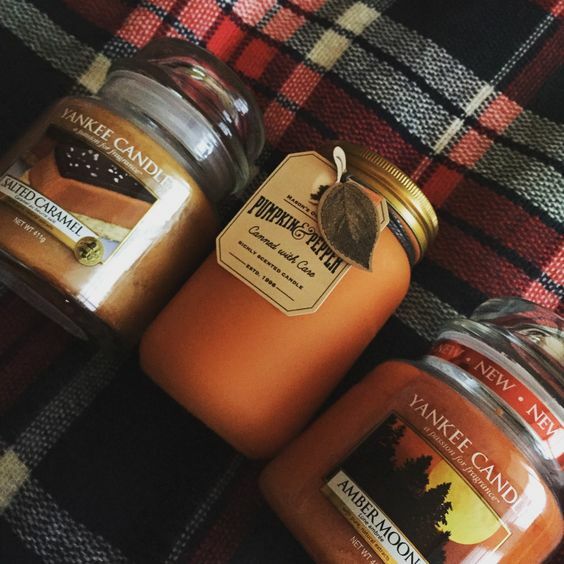 Nothing beats coming home to a warm and sweet seasonal scent after a frosty walk through the woods. Candles and oils are the homeliest of accessories and will go a long way to keeping you relaxed after a cold day.